Find Your Perfect Disney Sidekick & WIN Tickets To See The Lion King Musical! Ever wanted to know who your perfect Disney best friend and side kick is? Well..... ponder your thoughts no more! This awesome new quiz will let you know whether Tigger is your exciteable best buddy or if Mike Wazowski would be your hilarious roommate! AND not only that... once you've taken the fun easy quiz below you can then enter to WIN 2 tickets to see the incredible Lion King Musical in London next February!!! It's no secret that I'm a bit of a huge fan of Disney so when this competition was pitched to A Yellow Brick Blog I literally couldn't wait to get stuck in and get it up! If you follow me on twitter you will know that earlier this summer I was lucky enough to go and see The Lion King muscial myself thanks to my wonderful parents (thanks guys!) and I was blown away by it's creativity and talent and sung along to every single word... yes the 5 year old Kirstie came out in full force! I'm so so happy to have teamed up with awesome Internet Gift Store this Autumn to give one of you the chance to go and see it for yourself along with a friend or family member! SO get answering those quiz questions, find out your perfect Disney sidekick and enter now! You have until 18th December! 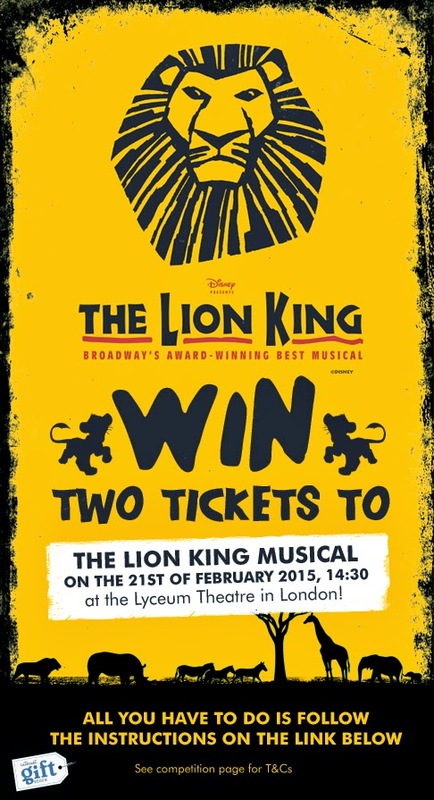 Win 2 Tickets To See The Lion King Musical in London! Would love to take my sister to see this, shes been dying to see it for ages! !